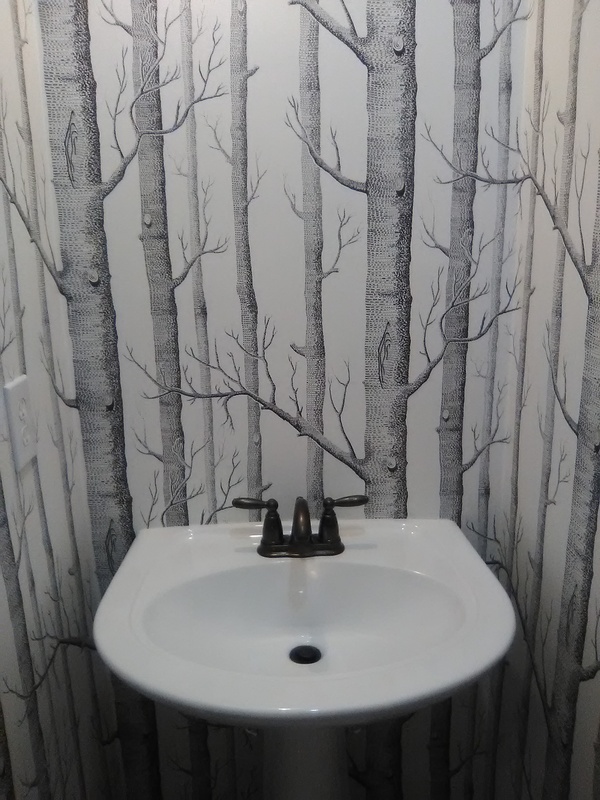 This powder room in a newish townhome in the Rice Military area of Houston was originally papered in a darkish jungle/ethnic/animal-themed wallpaper. It was a good look, but the new homeowners wanted something brighter and fresher. Plus, the original paper had been hung over the textured walls, and the bumps were showing through. It would have taken me two long days to strip the original paper, smooth the walls, and hang the paper. So the homeowner tackled the removal of the original paper (following instructions on my blog (see page on the right side) plus info she found on the internet), which saved her the price of a day’s labor. It also made my job a bit easier. But this job still required a lot of prep, which took a lot of time. The homeowners were out of town (they let me into the house via remote access), and it was nice because I could work in peace and quiet, and I could stay as late as I needed. I skimmed on smoothing compound, waited while it dried, sanded smooth, wiped off the dust, primed, and then finally hung the paper. The pedestal sink was tricky to get around, as they always are. And the bull-nosed / rounded edges of two outside corners in the room were a challenge. Additional hurdles were crooked walls, un-plumb walls, and a ridged non-woven wallpaper material that would not bend or yield to crooked, un-plumb walls. 🙂 The pattern itself was a bit forgiving of these imperfections, and I used a few tricks to make things look straight and true. This wallpaper design is quite popular, and I have hung it a bunch of times. 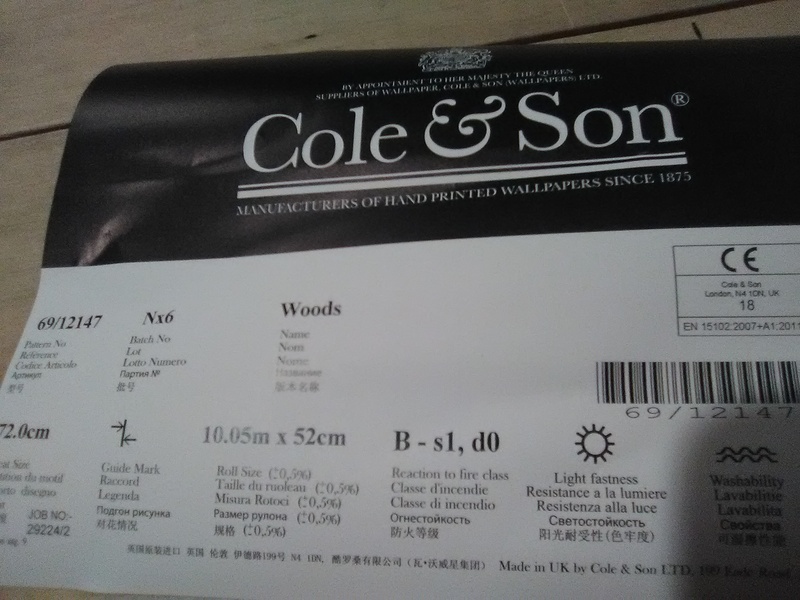 It is called “Woods,” and is by Cole & Son, a British company. It is printed on a non-woven substrate, and is designed to be a paste-the-wall installation – but I find that paste-the-paper is a superior method. Best of all, the homeowner loved what the pattern and light color did for the room. 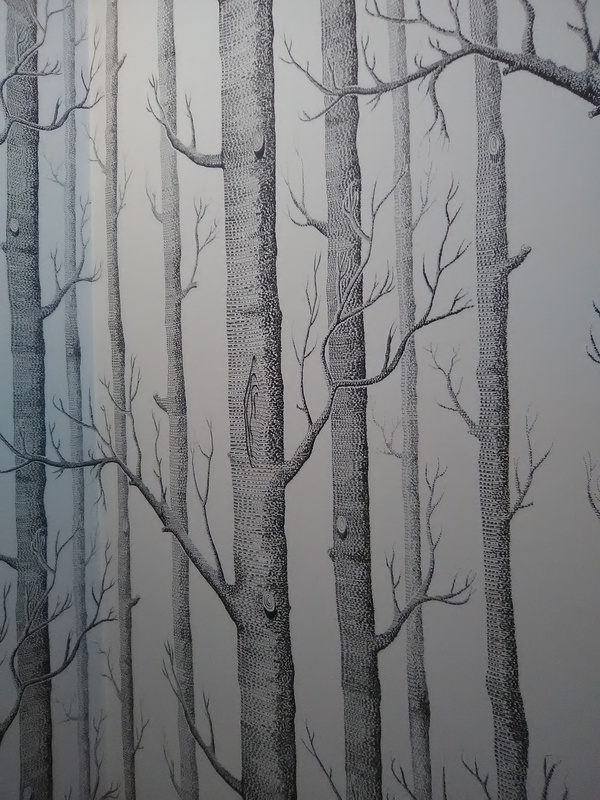 The powder room is instantly brightened, and the images of tree trunks give the room a whole lot of dimension and draw you in, as if you were actually walking in a forest. It was bought from my favorite source for good quality, product knowledge, expert service, and competitive price – Dorota Hartwig at Southwestern Paint on Bissonnet near Kirby. (713) 520-6262 or dorotasouthwestern@hotmail.com. She is great at helping you find just the perfect paper! Discuss your project and make an appointment before heading over to see her. I just did prep today, and that doesn’t make for very interesting photos or stories. So I thought I’d post a picture of the view out the windows in the rooms where I am working. Don’t I have a great job?! This home in Friendswood south of Houston was flooded during Hurricane Harvey last year. 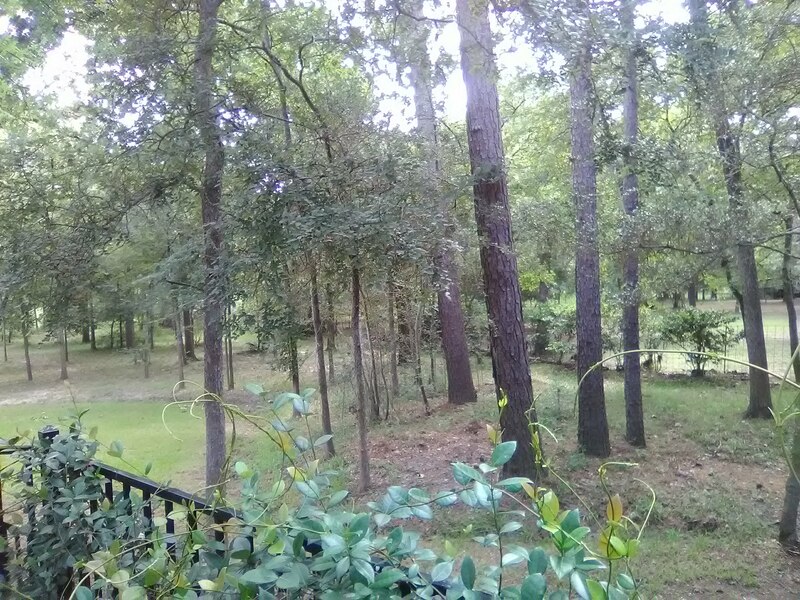 I’m standing on the back deck, and you can see how high it is off the ground – about 5′. The water came that high, plus another foot deep in the house. Nearly a year later, the homeowners are nearing completion of repairs to the home. Well, this has been a month of issues with stains on walls! I was smoothing these textured walls with joint compound, and noticed some red splotches on the paint. I studied them, but decided they were paint, which is stable and not a problem. But a little after I had skimmed over the spots, I looked again and noticed that the red color had bled through. Evidently it was ink, or lipstick, or child’s crayon, or some other such substance. Along with rust, blood, water, oil, mold and mildew, and a few others, these materials will bleed through paint and wallpaper. It might not happen right away, but eventually you will notice stains on the paper. These stains can be sealed with a stain-blocker. I like oil-based KILZ Original, but the shellac-based BIN primer is good, too. Water-borne sealers may be environmentally-friendly, but I don’t trust them to work as well. But in this case, I preferred to just get rid of the questionable areas. I took a knife and dug out the part of the wall that had the red spots. Those are the chips I am holding in my hand. Then I skim-floated over the area to smooth it, and proceeded with my wall prep and wallpaper installation. This home was repaired after the flood of Hurricane Harvey. 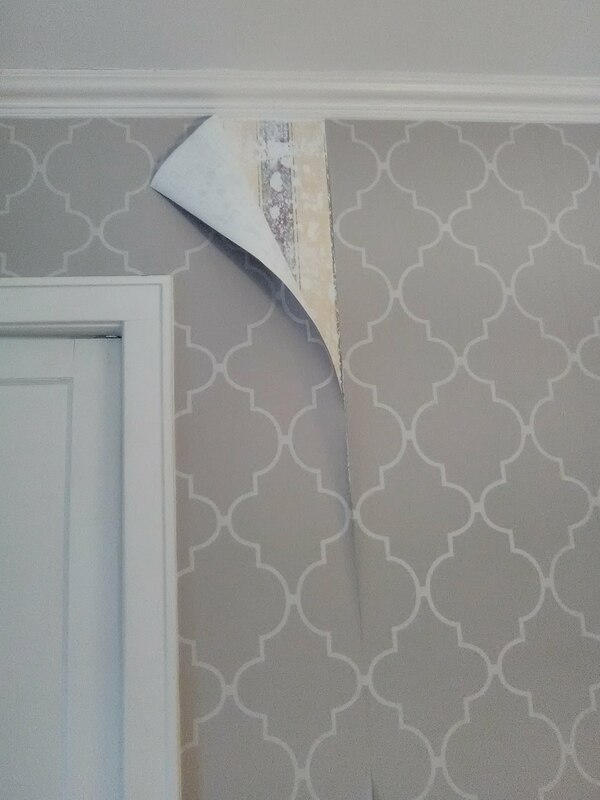 The contractor told the homeowner he would prep the walls for wallpaper. As you can see, his guys did get some parts of the wall nice and smooth. 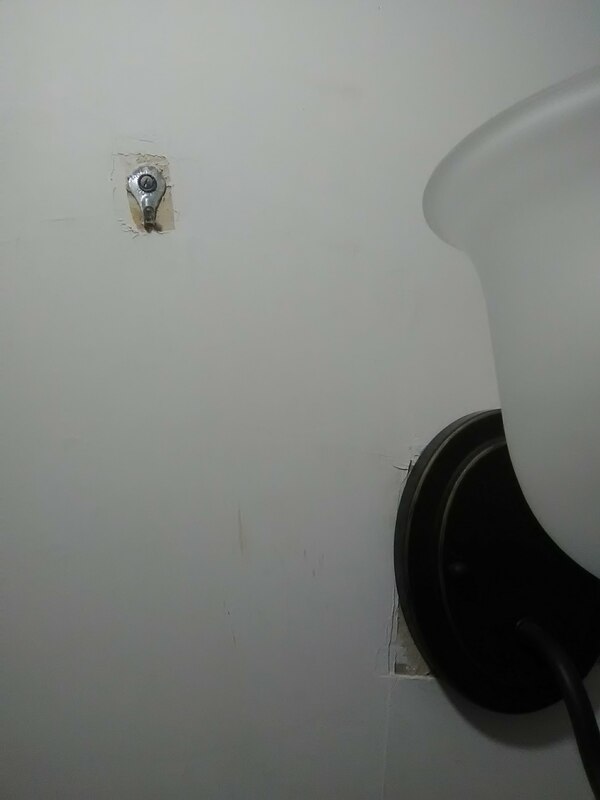 However, they didn’t bother to remove the mirror hooks, light sconces, or electrical switch plates. The result is some pretty gaps that will need to be filled in (by me) before I can hang the wallpaper. Best to just let the Wallpaper Lady do the prep. Paper-backed solid vinyl papers are about my least favorite of all papers. The main reason is that they tend to curl at the seams, especially when there is humidity present. The issue is that, IMO, the gritty manila-type paper backing is porous, and so it will pull moisture and humidity out of the air when the room is under humid conditions (teenagers taking long hot showers). Once this happens, humidity / moisture can enter the seam and soak into the paper backing, the vinyl surface can delaminate (come apart) from the paper backing, causing the surface to curl away from the substrate / backing. This is what you see in the photo. 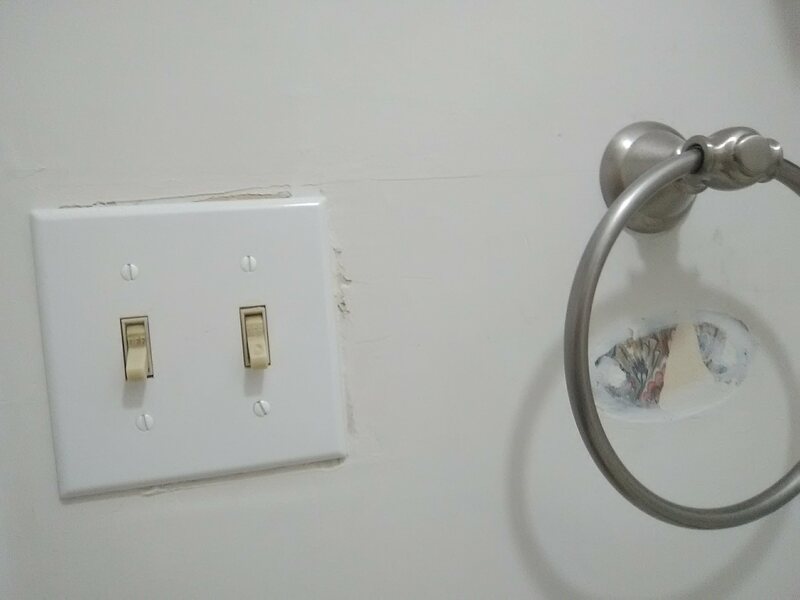 Because the two layers of the wallpaper have actually come apart, it is also very difficult to paste back against the wall. 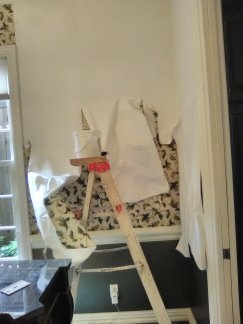 It would be far better to remove all the wallpaper, properly prep the surface (smooth, primer), and then hang the new wallpaper. Venetian Plaster – Whoever Thought This Was A Good Idea?! To me, unless you had a house that was designed from the ground up to look “Tuscan,” this wall finish never looked good in the typical American home. Even worse was when the finish was poorly executed. Please see the photos. I’m glad that the pendulum has swung, and people are going back to wallpaper. There are special prep steps that must be taken, so that the texture won’t show under the new paper, and so the paper can adhere to the surface (true Venetian plaster has a slick wax coating). The new homeowners bought an adorable 1920’s home in the Woodland Heights neighborhood of Houston, and inherited a dining room with a beautiful wallpaper pattern – that unfortunately had not been hung properly. The wallpaper was curling at the seams, peeling away, and literally falling off the wall. It is taking chunks of a white substance along with it. It’s hard to determine exactly what is causing the failure, but the first issue is that the underlying wallpaper was not removed. Since wallpaper has an acrylic coating, it does not provide a secure foundation for the new paper to adhere to. 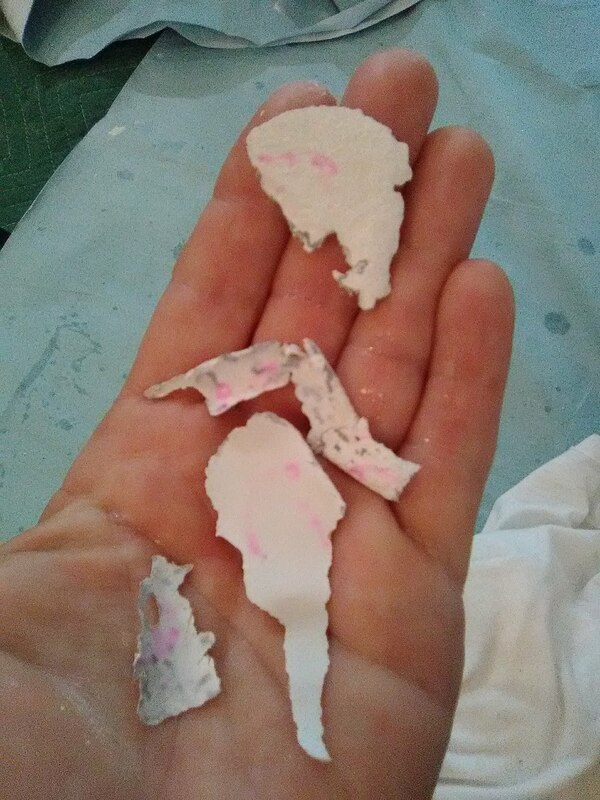 In some cases, it’s not possible to remove the old paper, and then the seams should be floated over, and the old paper should be primed so it will have a surface that the new paper can grab ahold of. 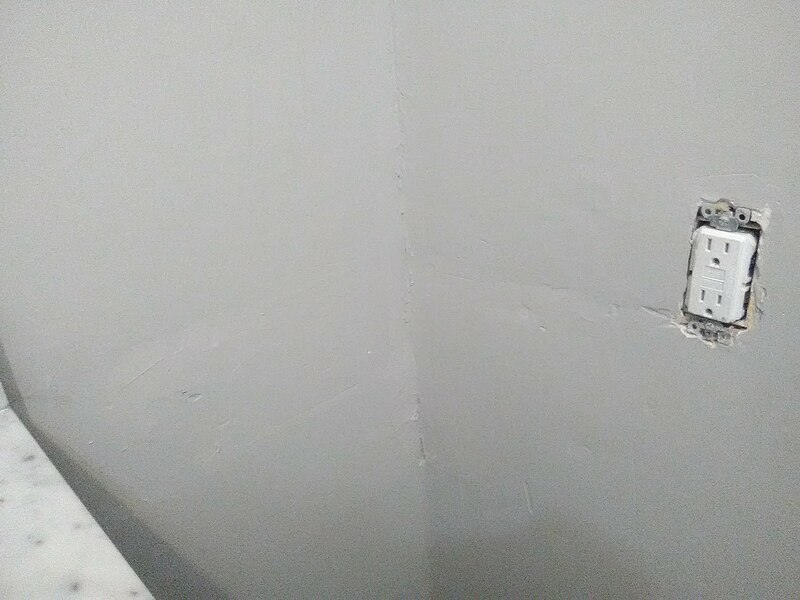 Here, it looks like the walls were either not primed at all, or were primed with a flat wall paint. Some of that paint is letting go of the old wallpaper and pulling away from the wall, which allows the new paper to fall off. Ideally, that striped ’90’s paper should be stripped off, along with any other layers of paper underneath. But it looks like some of the underlying paper was floated over, and that makes it particularly difficult to remove. I suspect there are other issues going on, so it will take some time and exploration to decide what will be the proper approach for removing the beige paper and then prepping the walls, before the new homeowners’ new paper can go up. We had a “situation” on this job, and the contractor had to rip out some drywall and quickly replace it. The work crew did a good job on the interior areas of the drywall. But where the drywall met the corners and edges of the room, and where it abutted the balusters on the stairway as you see in the photo, they dropped the ball. 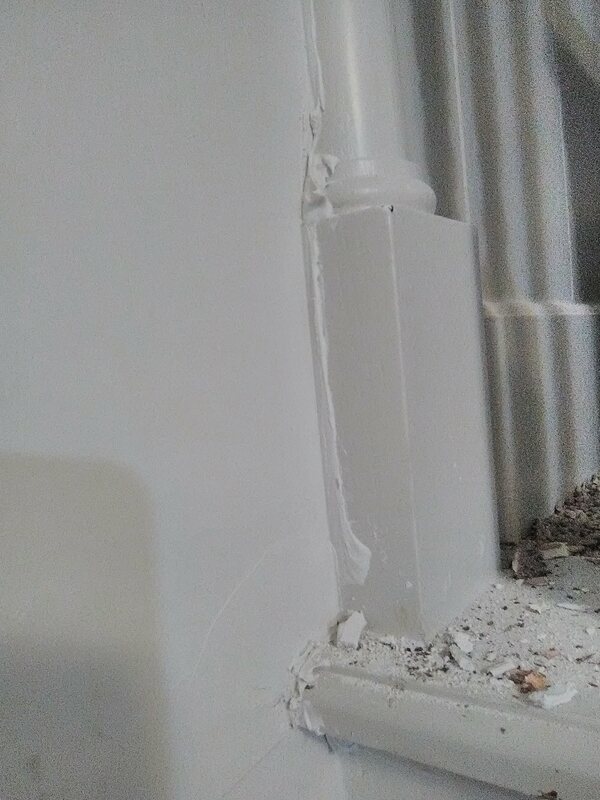 Some of their joint compound (the plaster-like substance that is used to smooth surfaces and to cover joins in drywall), got onto surrounding areas. See photo. Joint compound will wipe off easily enough with water and a rag. But in this instance, it’s thick enough that I am not sure it will wipe off. And, if it does, or if it can be chipped off the painted surfaces, it will probably leave a gap or rough surface, neither of which is good for wallpaper to stick to. 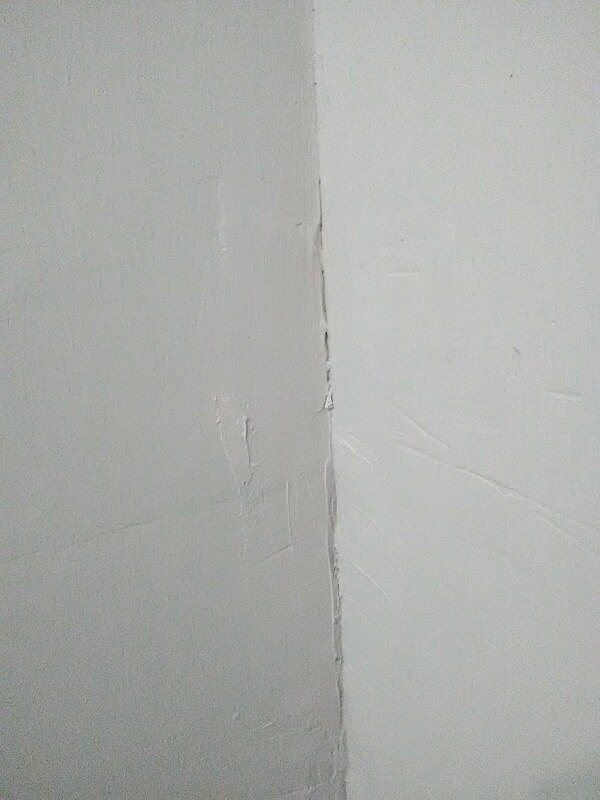 When I smooth walls, I have a special technique that I use in corners and along edges, that ensures that the paper will have “a good bed to lie in.” I also remove any smoothing compound that gets onto walls or woodwork. Just another reason to let the Wallpaper Lady do ALL the prep. People! Please do NOT let your painter or handyman or Uncle Billy “prep the walls for paper.” They may be good at painting or at general home repairs, but they do not know the intricacies of wallpaper, or what constitutes a properly smooth and sound and sealed surface, nor are they familiar with or know where to purchase wallpaper-specific primers. Trust me – I am much better at wall prep than they are. And, People! Please do NOT pull out your ruler and calculator and try to measure the room yourself, and do NOT go by any “guides” posted on-line, nor by the calculations of someone who works in a paint store and has a few wallpaper books on display. Figuring up how much wallpaper to buy is multi-faceted, and can be tricky. Many concepts need to be factored in – type of paper, manufacturer, pattern repeat, width of paper, length of roll, height of wall, on and on. And, People! Do NOT order your paper until the walls have been properly measured by a professional. A professional PAPERHANGER, that is, not a professional painter or Sheetrocker.